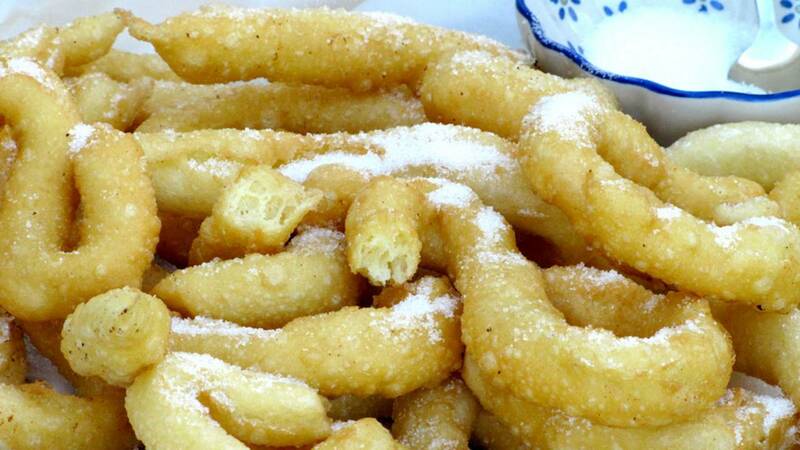 Video Recipe - I had churros first the time when I was 14, on a holiday in Spain. It must have been good because I have long forgotten my first kiss, which I think was roughly around the same time but I can still remember my first funnel cake with sugar. Bring the water and butter to a boil. Pour the flour and stir well until it is a cohesive dough. Beat the eggs into the dough one at a time. Place the dough in a freezing or piping bag. Heat the oil to 170ºC-180ºC (340ºF-360ºF). Cut a corner of the freezing bag (if using one such). Approximately 1 cm (½ inch) wide. Better too small than too large to begin with. Press the dough out of the bag and into the oil in long lines. Shape and length does not really matter. But don't add so much to the deep fry that it sticks together. When they are golden on one side, flip them. You typically have to fry them for a total of 5-10 minutes. A piping bag with a star shaped tip is the best and gives the crispiest version. Mix and warm it all up in a sauce pan until it is a thick sauce.